I find the posts on Chess Vision to be excellent for Chess improvement and recommend that you take a look. A recent post talks about the game Troyis which is both fun and great training for knight movements. Troyis fits in with the philosophy of many of the Circles exercises. I am currently rated #6424 in the world with a high score of 165,800 as Tactics max. Not impressive, but can you beat that? Sir Kaan Kara and Silver King are added to my navigation bar as Knights in the Heat of Battle and the Knights Errant FAQ is updated. Fellow Knights: please update your list of Knights. Note that if you are using this technique then your list of Knights has been updated for you automatically. Please visit our new Knights' blogs and give them a hearty welcome! Double Ouch! Two short rounds ago I was 3-0 in the LEP Tourney and now I am 3-2. In my two losses my opponents have played well and deserved the win. This round five loss was to the tourney sponsor. What can I learn about me (naturally, it's all about me) from my losses to improve in the future? What I "intended" may be best and consolidates and wins. Yeah, black will have to pay attention, watch the two bishops, avoid checkmate and repetition but this is winning. Black is up the exchange, has a better pawn structure and White's attack has stalled. 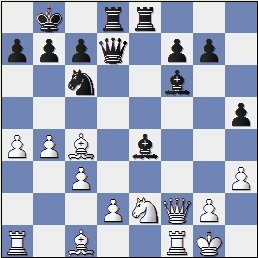 But, I (black) blundered here and lost. What did I do? All of my games in this tournament can be replayed in your browser here. My round 4 loss against RLP was due to executing a bad plan. Overall, I think that is a harder problem to address. Blunder or the wrong plan? Which is worse? At least I think that correcting the blunder problem in the future is likely to be easier than formulating better plans. What do you think? Improving at chess requires brutal honesty about one's strengths and weaknesses. I am just scratching the surface here and being somewhat facile about the weakness in my play. But it's a start. Ouch! Yeah, I know I played a provocative and unorthodox opening. But that is not what cost me this game. It was my 17th move. I was fixated on the need to attack my opponent's King and forgot what is more important than an attack on the wing: the center. My opponent RLP played well. He kept up the pressure and put me away nicely after 17. a5?? moving his knight via e5 to the killer square d3. Oh well, live by the sword, die by the sword. The game is here. I'm now 3-1 in the LEP tourney. Caquetio Knight has the pattern up for the drill King and Knight versus Queen. If the knight is on a blue square there is a square to place the queen that wins the knight. That is the meaning of the diagram, right? Simple Knight ponders security versus activity. Sir Augusto loses to a 10 year old (Fide Master Arthur Gontijo!). Sir Miklos needs help with Chess Publisher. Sir Nemo has games and tactics from the UNM Octagon and plans his assault on the Seven Circles with CT-ART. Chessaholic gives us this glimpse into the soul of Kasparov: "The position, where the small pawns were victorious over the enemy, was so surprising that it seemed like a fairy tale and I was unable to live without chess after seeing it." Retired Pawn tells us in Chess in Education Part V that "researchers report that playing chess reduces the risk of developing Alzheimer’s disease since the game keeps the brain active, and the practitioners’ of the game are 260 percent less likely to develop the malady". Tacticus Maximus (that's me!) 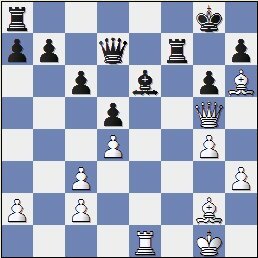 has been drilling tactics with Winning Chess Tactics for Juniors by Lou Hays. I'll resume my tactical studies with PCT in the near future.